Cigar marketing is almost always directed at smokers who go for a certain style. The broad categories are well know — there are the mild-to-medium bodied cigars that appeal to a certain group, the heavy-duty ligero bombs that appeal to another group, and then there’s the boutique crowd. There is some cross-over, and a lot of advertising flim-flam, but achieving real distinction within a certain style can’t be easy for a new brand or line. 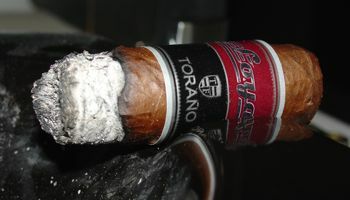 Toraño’s Loyal blend was introduced in 2011 as a way of “providing outstanding value to cigar lovers.” Most cigars made by Toraño have a high quality-to-price ratio anyway, so I was interested to see what they would come up with when the bottom line was the bottom dollar. The wrapper on the Loyal Robusto is a dark and mottled colorado leaf with considerable tooth. It’s also very thin and prone to cracking, but the two sticks I smoked for the review survived mostly intact despite some fine wrapper splits. The cigar has a flat head and the cap is cleanly finished. The draw is a bit loose, but since that didn’t affect the temperature of the smoke I didn’t count it a serious flaw. The burn, in fact, is even and slow and mostly on the level. The ash is a little flaky due to the thin wrapper, but it’s solid and holds well. 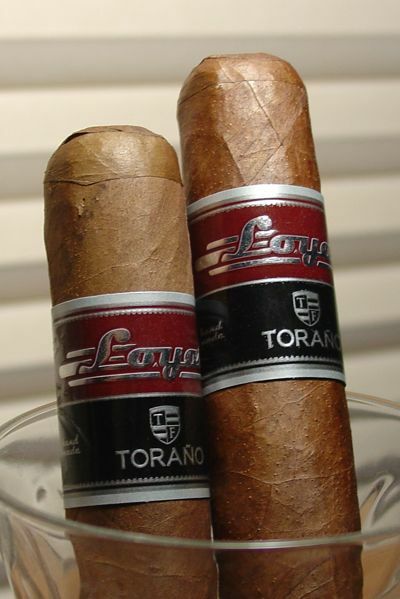 The Toraño Loyal Robusto is a smooth and easy smoking cigar. The first half is characterized by caramel and graham cracker flavors, and the fragile wrapper contributes a sweet and complex aroma. There is just a touch of dryness on the palate. The smoke is medium in texture, but fairly mild in strength. The second half brings out more cocoa and coffee flavors while the aroma remains soft and sweet. There is a gentle transition from the first half to the second of this robusto, but it goes easy on the drama. The subtle complexities of the aroma could easily be overpowered by stronger tasting filler leaves, but that doesn’t happen here. This blend’s primary virtue is balance. Toraño’s Loyal was designed with value in mind, and value it certainly delivers. It’s not exactly a “bargain” cigar, but the MSRP is around $5 USD for the robusto; add two bits for the larger sizes. Value aside, the Loyal is also a fantastic cigar to pair with a cup of coffee. 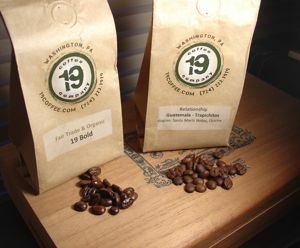 Lately I’ve been brewing coffees from Washington, Pennsylvania’s 19 Coffee Company. I’ve sampled three different offerings from 19, and they have all been remarkably smooth. Even their Bold blend, which is a rich and full-bodied french roast style coffee, is also as smooth as a china cup. Their Centrals have been extremely well balanced for light-roasted coffees. My wife is especially fond of the Guatemalan Trapichitos, in which she finds a caramel note that she really likes. Any of these coffees would be a great companion for Toraño’s Loyal. I have only had the torpedo version of this one, and although it was enjoyable, it didn’t seem to be one that sticks in my mind. Maybe a different vitola would be in order for me. Have you had all the different sizes? I read Christine’s review at Mike’s Stogies, and she seemed to feel that the Churchill brings more richness and complexity to the table. 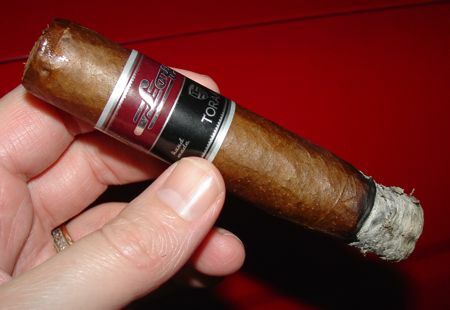 The robusto is the only size I’ve tried so far, but I’m sure I’ll be picking up some of the others at some point. I agree that it’s not a big impact cigar, like the Blancos Nine is (yum), but lighter bodied cigars rarely are. On the other hand, it has a lot of character for a milder cigar. Especially for five bucks. What do you like to smoke in the mild-medium category? I agree the price does give it more allure. As for the mild-medium smokes, I like the Guillermo Leon, Perdomo Reserve Limited Cameroon Petit Corona, Torano 1916 Cameroon, and Vallejuelo (among others), although I guess those are all pretty solid mediums. EPC New Wave Connie would be a good mild-med. I would put the Four Kicks and Cremo Classic in there, but I’ve only had one of each so far – they’re a little hard to get a hold of around here. I have smoking the BFC for the last few weeks. I am enjoying them. Review is pretty spot on and is for me a good smoke for the price. For a mild-medium bodied cigar this is a good example of a cigar that can be enjoyed by newbies to seasoned pros. Never less than pleasant the taste gets better as you smoke it. Although I prefer fuller bodied smokes I can’t fault the taste which ranges from good to delicious. It’s just overall pleasant and compared to equivalent Cubans it is every bit as good, no, it’s better when you factor in price (U.S. viewers may not quite appreciate this. U.K. review here!). I also think 56 ring gauge is almost the ideal. I’m used to smoking 60’s (and my next smoke will be the BFC) but it just feels a good gauge to smoke. The construction was excellent, the wrapper was nicely toothy and the overall appearance was very appealing. It burned at a nice pace, about 75 minutes to smoke it. It’s an all purpose smoke, good at any time, and I would rate it a solid 88/100. Try one and enjoy!